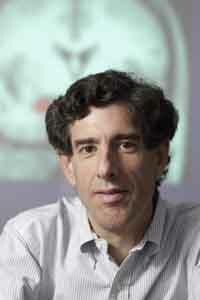 In a lecture Thursday, March 17, University of Wisconsin psychology professor Richard Davidson will discuss his research showing how brain activity influences human emotions and the immune system. Photo by Jeff Miller. A little meditation every day can change a person's ability to live in a happy state of being, according to the research of neuroscientist Richard J. Davidson. Davidson is the director of the Center for Investigating Healthy Minds at the Waisman Center at the University of Wisconsin in Madison, Wis. He will present a free lecture, "The Life of the Mind: How It Affects Our Health, Happiness and Ability To Learn" on Thursday, March 17, at 6:30 p.m. at the Community School auditorium in Sun Valley. The lecture is sponsored by St. Luke's Wood River Foundation and the Sun Valley Wellness Institute. Davidson will present an overview of the laboratory studies he conducted over the past six years on neural changes associated with different forms of meditation. Distinctions among three major forms of meditation practice will be made, including focused attention, open monitoring and positive affect training. These different forms of meditation have different neural and behavioral effects. Davidson will highlight data from studies on long-term meditation practitioners as well as those with shorter durations of training. He will also review studies that track changes over time with meditation practice. The presentation will also summarize meditation-induced changes that have been found in the nervous system that may modulate physical health. The central circuitry of emotion is especially implicated in biological changes that have consequences for health. The overall conclusion from these studies is that one can transform the mind through meditation in ways that may be beneficial to mental and physical health. As a testament to the far-reaching effects of his research, Davidson's Center for Investigating Healthy Minds received a grant from the Dalai Lama's personal trust to further its research mission. The $50,000 grant is "to support the Center for Investigating Healthy Minds in researching healthy qualities of mind like kindness and compassion," according to the grant agreement. Time magazine named Davidson one of the 100 most influential people in the world in 2006 for his collaborative work on mind-body medicine with the Dalai Lama. He is the recipient of numerous awards for his research, including a National Institute of Mental Health Research Scientist Award, an Established Investigator Award from the National Alliance for Research in Schizophrenia and Affective Disorders, a Distinguished Investigator Award from NARSAD and the William James Fellow Award from the American Psychological Society. He received his doctorate in psychology from Harvard University and has been at Wisconsin since 1984. The Ada Canyon Medical Education Consortium is offering continued medical education credits for physicians who attend Davidson's presentation at the Community School. The presentation is designated for 1 AMA PRA Category I credit.